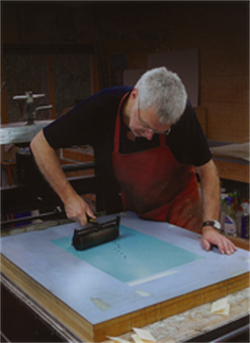 At Blencarn there is a painting studio and a printmaking studio for stone and plate lithography. Visitors are very welcome. Please telephone or email to arrange a mutually convenient time. The studio is at Glen Cottage, between a Scots Pine and a Silver Birch, 60 metres from the telephone box in the centre of Blencarn – an idyllic fellside village in the Eden Valley, situated at the foot of Cross Fell, ten miles east of Penrith, Cumbria, UK. The Studio: Glen Cottage, Blencarn, Penrith, Cumbria, CA10 1TX, UK. If you would like to hear about up and coming events, special exhibitions, or new bodies of work then please fill in your email address below. I will not pass your information on to any third party and will email only very occasionally. After you subscribe you will receive an automatically generated email asking you to confirm your email address, please follow the instructions in the email to complete the subscription. Click here if you wish to unsubscribe.